Earplugs FlyFit - Alpine - Weblens - Your Contactlenses Online ! Comfortable fly-out caps with which you no longer suffer from pressure differences in the ear during the rise and fall of the aircraft. Comfortable fly-out caps with which you no longer suffer from pressure differences in the ear during the rise and fall of the aircraft. FlyFit earplugs are also ideal for dampening annoying ambient noise during travel by car, train and plane. The soft Alpine FlyFit earplugs feature special yellow filters that attenuate annoying ambient sounds. 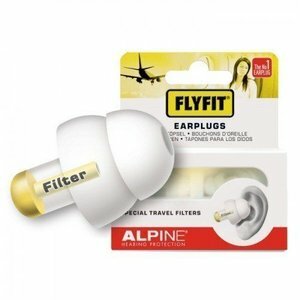 With Alpine FlyFit earplugs you can finally travel relaxed and arrive much fitter at your destination.